Since we have increased activity in imaging old Atari ST floppies, I take chance and start list of titles which still are not properly imaged. Hopefully someone can dig out something. Please image, even if it works not on your Atari or imaging SW report errors. Partially good image is better than nothing, and it is possible to make good image from multiple incomplete sources. Last edited by AtariZoll on Sun May 03, 2015 9:09 am, edited 4 times in total. I have a copy of Space 1889 at home. I will try to image that as soon as the new diskdrive for my SCP arrives. Will post them really soon (well, Crown and Creation 3D is already done, but I've something to see before posting the archive). Albedo for the Amiga has been done, but not the ST version as far as I know. I've got two different Atari copies of Amberstar (English and German) but the disks are not copy protected in any way. Anyone got a SCP near Oxford? I have "Tetra Quest"... but it is the version that crashes at high score screen. Also i have "Jupiter's Masterdrive", not with box though only disk so i dont know what release it might be. I don't have the English version, but I may have the German version if you need it (was sent by ICS long time ago). Stefan jL wrote: I have "Tetra Quest"... but it is the version that crashes at high score screen. Tetra Quest bad v. is at AM, so no need for it. I tried to make an SCP of Jupiters Masterdrive but it does not work... the STX conversion by Aufit does not work in Steem and when i write the SCP image back to disk so does it not work either... it just says "insert original disk" when booting (just like STX in steem). Hello guys check on the forum for the french relese of bat 2 i have posted quite a long time ago an stx dump of it. Got it And I will write to Marakatti, who maybe forgot it - let's hope that it is why is not present now at AM . I recieved my "new" floppy diskdrive yesterday, but I have no time to rig it up and image Space 1889 until later this week. Hope that it's okay as this was my first attempt using the SCP! Seems to work up to the point of asking for documentation protection. When creating images I recommend to create images with 4 or 5 revolutions sampled. Otherwise there is a high chance they wont be converted correctly to stx by Aufit. I have made Nightdawn pasti long time ago. It is in Kind of magic compil. It is in Atarimania ftp, but they not are put it online yet. Probably because Nightdawn crashes on STE, so in Steem too. Not STX fault. I just checked - there is no Nightdawn in Jake DIR there. I'll keep that in mind the next time I create an image. How big is the difference in size of the scp-image with 4 revolutions? Figure 5MB per side per revolution. So, about 50MB for double-sided 5 revs. Using 7 zip for compression can reduce the size by up to 80%. AtariZoll wrote: Probably because Nightdawn crashes on STE, so in Steem too. Not STX fault. 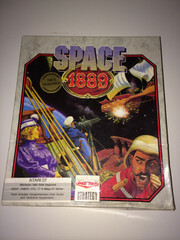 Here is a new copy of Space 1889. This time I used 4 revolutions. I have also begun imaging my whole collection of original game- and utility disks. I can share them with you if you're interested. AtariZoll wrote: Since we have increased activity in imaging old Atari ST floppies, I take chance and start list of titles which still are not properly imaged. Hopefully someone can dig out something. Please image, even if it works not on your Atari or imaging SW report errors. Partially good image is better than nothing, and it is possible to make good image from multiple incomplete sources. There is/was STX of Beastlord at AM, but it has some bad sectors. So, doing it again, after some cleaning would be good.